You may have noticed that I’ve been keeping a low profile for quite a while. In fact it had been my avowed intention that this blog was ended. However, it’s Christmas and I thought one last foray into cyberspace was called for as the New Year’s Honours List approaches, bringing with it (as it surely must) recognition for my status as the country’s foremost expert on home education. Yesterday I was on my way back to the car from a rather frustrating Christmas shopping trip when I was assailed by a familiar voice. My old nemesis was waving the Christmas edition of the Big Issue at me dressed in a Santa hat. She grinned mischievously at me revealing all three of her teeth. I was instantly concerned. Surely this old harridan hasn’t seen a copy of the Honours List ahead of me? I opened my mouth to reply, but decided it wasn’t worth it. Instead I pulled a £5 note from my wallet and exchanged it for a copy of the magazine. She fumbled in her pocket, but I shook my head. There was a wicked glint in her eye as she extracted the most appallingly battered piece of mistletoe imaginable and held it aloft. “Well in that case, you can have a little kiss instead,” she trilled, puckering up and closing her eyes. While her eyes were still shut I fled. I arrived home just as Old Mrs Mort returned from her assertiveness class. This is a worrying new trend, especially as much of her homework seems misdirected at me. Her tutor always gives her a lift back from the community hall and was escorting her up the drive as I locked my car. “You!” yelled old Mrs Mort at the top of her lungs. Oh Lord! Whatever now? Why must she shout? People were peering through windows at me as the tutor egged her on. “Merry bloody Christmas..!” she hissed vehemently. Old Mrs Mort crossed her arms and glared at me for a moment before flouncing off towards her front door. “What’s the matter with you?” my wife enquired as I walked into the kitchen. I’m not convinced. Of course I blame Smith. These home edders have a nasty way of winding up public opinion – especially against me. Did you see the MPs handing in those petitions the other week? They practically spat out the name “Bad-Man” when they made their proclamations. “Smellies will do,” she said without lifting her head from her economic science activity. “Did they?” she looked up amazed. My wife put down her spoon for a moment and looked at me thoughtfully. “Probably home educated,” she laughed. I was alone that evening as my wife was helping the Rev. Thomas rehearse the children for the church nativity. I had offered my services, but it seems the Rev. Thomas declined. Apparently they will be using a live lamb and for some reason he didn’t want me anywhere near it. I told him I thought it was high time that whole guinea pig business was dead and buried for good, but he went a funny shade of puce and told me that it was – under the vicarage apple tree. There was a ring at the doorbell and I hurried to answer it. Outside in the porch were two spotty youths. One was sporting a Santa hat and the other wore some kind of hairband with antlers sprouting out of it. As I opened the door they launched into the most tuneless rendition of a carol I have ever heard. A collecting tin was rattled in my face and apart from a loud sniff the youngsters stood in sullen silence. “Carol singing, innit,” the taller lad muttered. He rattled the tin at me again. The two lads looked at each other in horror. “..And then people gives us money..” the second lad finished. The two lads looked at each other in confusion before one of them launched half-heartedly into There Is a Green Hill Far Away. “Go on then. You tell him why he’s got it wrong,” I instructed. I shook my head slowly. I didn’t want to ask the obvious question, but it has become second nature these days. Both lads became extremely animated. I could feel a headache coming on. “But… wait… didn’t you want some money…” I called weakly. I watched them walk up the drive and turn into the Smith’s garden. Moments later I could hear the excited babble of their voices as Mrs Smith invited them in. I sighed a breath that seemed to draw every last ounce of my energy and closed the door. A sound from the lounge reached me and I scratched my head. Glancing at my watch I could see it was still too early for my wife to have returned. That left only one possibility. Autonomous Ed! I’ve hardly seen the ungrateful, tom cat for weeks. He seems to divide his time between Miranda Smith next door and Old Mrs Mort, but he still sneaks back into the house when he thinks I’m not around. Snatching my umbrella from the hall stand I rushed into the lounge brandishing it and snarling. 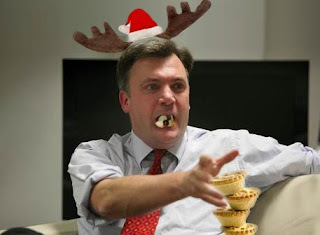 I was greeted by the sight of Ed Balls sitting in my favourite armchair and tucking into a mince pie. He looked greatly affronted and put a hand up to his hair. Ed Balls tapped his nose conspiratorially and hissed a “Shhhhhh” that sprayed pastry crumbs all over the carpet. He looked offended again as he patted his pockets, coming up with another mince pie. “These really are very good. I’ll bet your wife does scrumptious sausage rolls too. I suppose there aren’t any of those in the kitchen?” he asked hopefully. I just stared at him and after a moment he put the pie down on his knee and brushed the crumbs from his fingers. “Oh for crying out loud!” I thrust the paper back at him. He smoothed out the creases on his knee and grinned at the image in delight. Pie crumbs were wedged between his teeth. I ran a weary hand over my goatee. I was developing that dull ache in my soul that seems to be a feature of my dealings with Ed Balls. I sat back down as he dabbed his eyes with a silk handkerchief that had ‘Balls’ embroidered on it. I was really puzzled now. Telephone bill? What did that have to do with me? Ed Balls looked so shame-faced he almost stopped eating. “Sorry,” he shrugged. “Ah… that wasn’t me.” He waved a finger. “No – there’s more to it than that. OK, let’s have it. Come on!” I demanded. “I thought we could send something to Ed Balls,” I said flatly. “No, I’ll sort out the filling.” I said, standing up and going to fetch my coat. Worth the wait as always. I like the 'Education is schFit'. I may give my 8yr old permission to use that phrase! Thanks for the light relief Captain, and very HAPPY NEW YEAR to you.